I always struggle to express to undergraduates just how important it is to understand Asian American experiences from the community collectively known as the “Boat People.” Thanks to IPUMS-USA (Ruggles et al. 2015), though, I can make this figure. 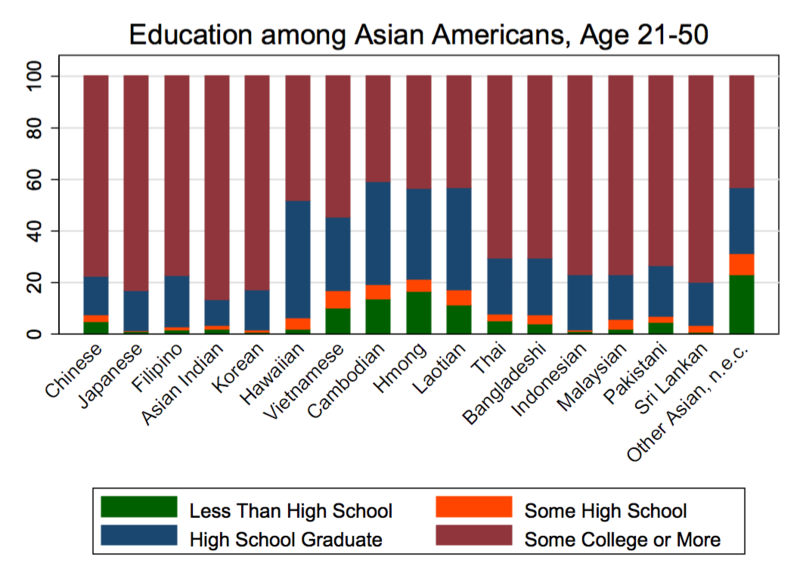 It summarizes the distribution of educational attainment for major census subgroups from the 2010 American Community Survey, for everyone aged 21-50. This simple graphic summarizes very effectively how refugees from former French Indochina compare to other Asian and Pacific islanders. It can never replace a complete analysis of the experiences of actual communities, nor can it represent the many ways in which the legacies of war are experienced among millions of people in the U.S. (and Australia, and France,…) today. It does not suffice to explode the myth of the model minority. But I hope it can start the conversation.